The Broadcast Tools® Time Sync Plus provides four separate GPS time referenced outputs. The first is a SPST relay, which pulses at 12:00, 22:00, 42:00, 54:30 each hour and is user programmable in each of four locations for any minute and second each hour. The second output is an active high driver with a 100 ms pulse each second, while the third output is a 4800-baud, RS-232 serial port providing a time zone adjustable hours, minute and seconds time code. The fourth output provides an active high driver in the ESE TC89 or TC90 serial time code format. Indicator LED’s are provided to display power/valid GPS data, programming mode and time sync relay operation. 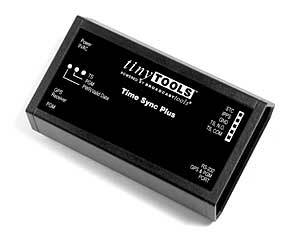 The Time Sync Plus is powered by a surge protected internal power supply. The Time Sync Plus may be rack mounted on the optional RA-1 mounting shelf. Each Time Sync Plus is supplied in a small profile plastic enclosure, while the Garmin 12 Channel GPS receiver with embedded antenna is housed in a water-resistant case and designed to withstand the rigors of outdoor conditions. The GPS receiver is supplied with an approximate 10-foot cable; longer CAT-5 cable lengths of up to 100 feet may be used.